Cheyne Magnusson to bring his Waco wave-park sorcery to Wet ‘N’ Wild Palm Springs! "I am definitely not with American Wave Machines," he says. Here’s a hot piece straight off the wire. 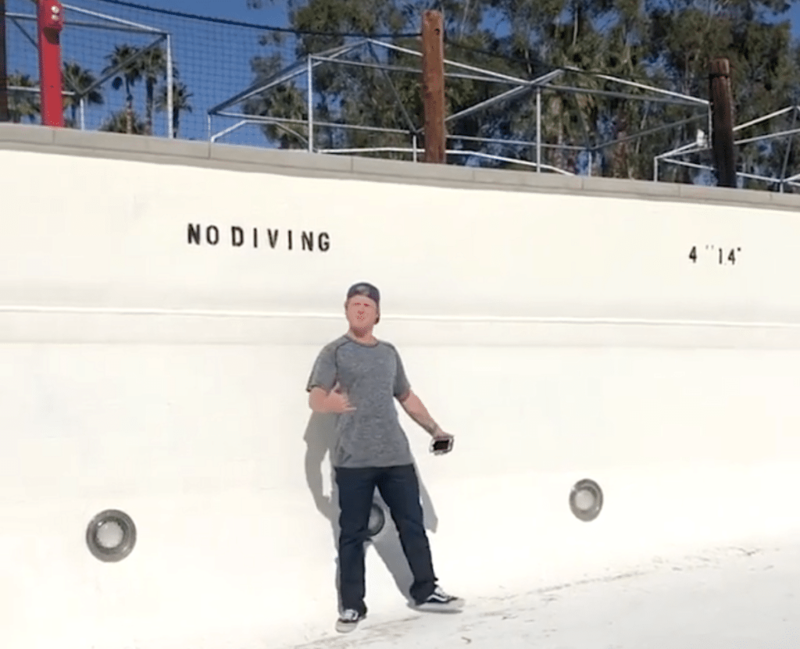 The Hawaiian surfer Cheyne Magnusson, who singlehandedly altered the course of aerial surfing at BSR cable park in Waco, has been signed to design and set-up a pool at the old Wet ‘n’ Wild site in Palm Springs, California. The cat was allowed out of its bag, briefly, in an Instagram post from another California-based Hawaiian, Kalani Robb, who has also been hired for the build. Oowee, do it look familiar? It’s the same pool that was used in the opening sequences of North Shore, a film from 1987 that tells the fictional tale of Rick Kane, a boy who learns to surf in a wave pool and then attempts to transpose his skills to Pipeline with mostly good results. Cheyne then asked if the Asthon-Chas sock at Surf Expo was real, which I explained it was. Are you still with American Wave Machines and therefore does this mean you’re going to use AWM tech? I say, without you, Waco would’ve been another crummy pool. It only got good when your freckled hands started pulling the levers to create the best wedge anyone had seen anywhere. Cheyne says he’s been to the Palm Springs site “a few times” and that he’ll be able to loosen his lips a little more in around a month. 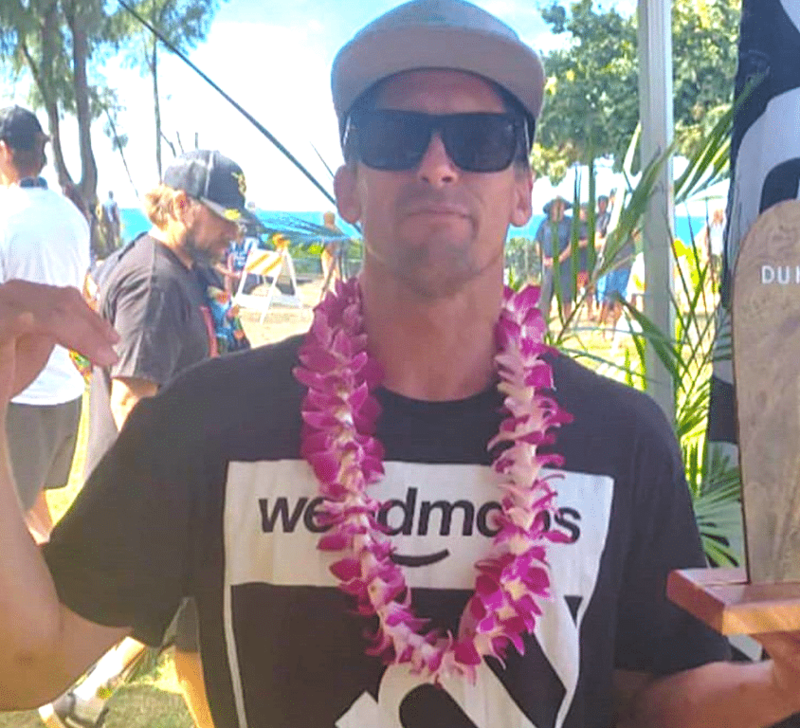 Sponsor shock: Bruce Irons rocks WeedMaps head to toe during 5th place Da Hui Shootout campaign! A sponsorship change for the iconic Kauaian? Sponsorship and surfing have gone together like “disorderly” and “conduct” since those brave Australians busted down the door some 40 years ago. Can you picture Kelly Slater without also picturing the Mountain and the Wave? Or mighty Mick Fanning without his Reef sandal bottle opener? Surfers become synonymous with their brands and vice versa, shocking the system whenever there is change. Kelly’s board sans Quiksilver still looks naked. And right when we all started getting used to seeing Bruce Irons in RVCA it appears that maybe another sponsorship shift is in place. Bruce, of course, was impossible to imagine without the Volcom Stone. They were such a pair, perched atop the Gerry Pipe house, making movies, surfing and rabble rousing etc. It seemed the romance would never die but then it did and four years ago RVCA dancing along, offering its strong knuckle’d hand. That was an ok fit, maybe, with the heavy Hawaiian flavor and we settled into it like we settled into Brad and Angie post Brad and Jen. But now maybe there is another change. 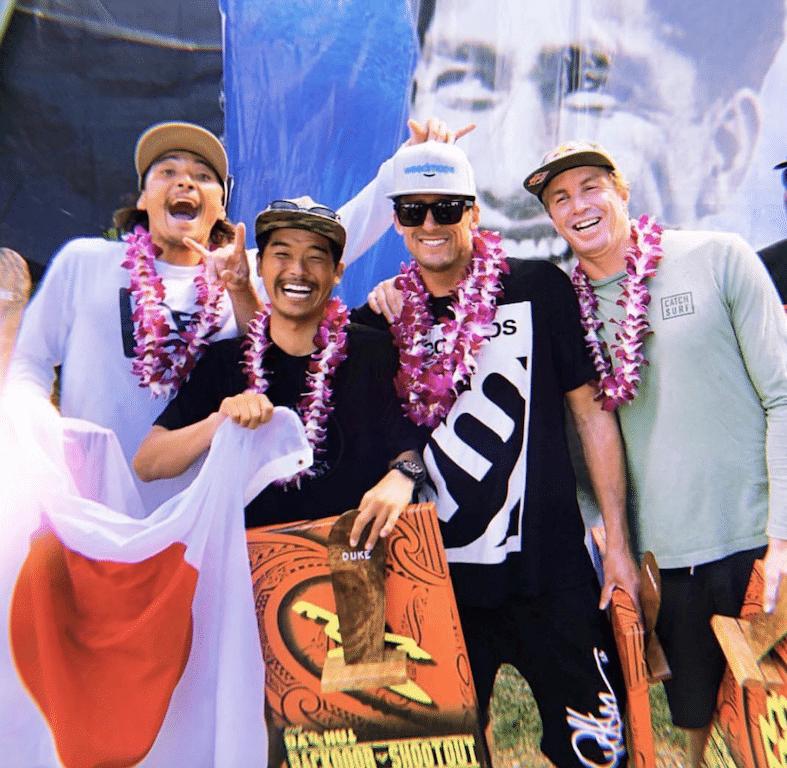 Yesterday was the final day of Da Hui’s famed Shootout with all manner of Hawaiian surf royalty participating, laughing, enjoying the best Pipe contest around. Bruce Irons got fifth place but there was no RVCA hat upon his head and no RVCA shirt on his torso and no RVCA sticker upon his board. WeedMaps, it appears, has acquired the real estate. Will we be able to settle in like we did Brad and Neri or will we always miss Jen? Is Santa Cruz back? Is that too much to hope for? Santa Cruz lost the title Surf City, USA to Huntington Beach in 2004 and seemed to lose its mojo along with it. Meth descended upon the once proud town, eroding locals’ features and pride. Sadness reigned. The surf world turned its back. And really how rude. Santa Cruz is the place where Peruvians first taught mainlanders their wave dancing. What a history. What a gift to cherish but meth etc. and it seemed as if it was just easier to forget. To pretend those brave Peruvians went to Huntington Beach instead. Not even native son Nat Young’s exciting World Surf League campaigns (2013) were enough to break the spell and hope was all but lost. Until Jan 1. 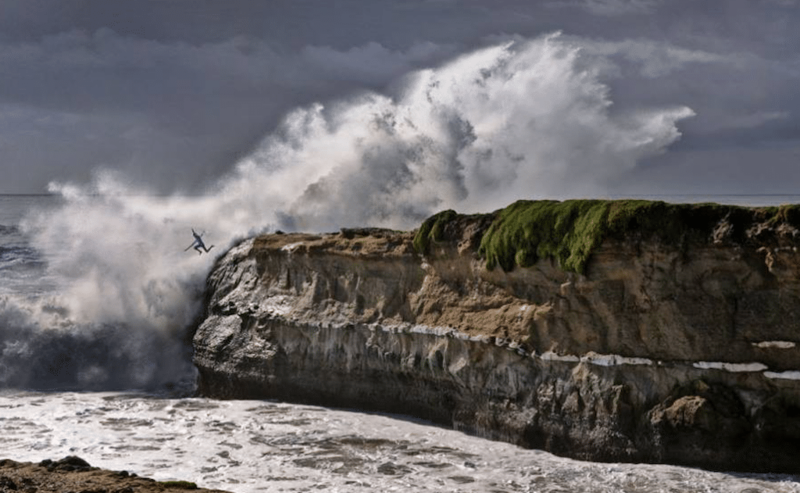 2019 and is Santa Cruz’s frown finally turning upside down? If Surfline is any indication of anything (and it usually isn’t) then yes! Let’s turn there now and read about the just finished Prime Series at the very famous Steamer Lane. I haven’t read Steamer Lane described so effusively since 2004. Is Santa Cruz back? Is that too much to hope for? I’m tired of Huntington Beach. "Surfing is my first love!" Yes? I see your hand waving there in the back. Do you have something you’d like to say? DJ Paul Fisher is the current most famous surfer-songerwriter around? Well, that’s a bold claim and I think maybe a touch enthusiastic. Let’s give him a couple decades before re-visiting. Ok? Willie released two albums in 2018, in his eighties. Do you hope to be doing the same 40 years down the road? Yes and no. It is inspiring, but whether or not I’ll still be doing it, I kind of look at my dad who was the same thing as Willie, but with surfing. Surfing is my first love and I hope to still be surfing at that point and maybe not touring. But I love that Willie does it. And maybe still be making records. That would be nice. So there we are and I have a few further questions for you. Is there a particular age you have in mind when plan on hanging it up? Tokyo 2020: U.S. Surfing facing “a bleaker situation” hires new head coach! 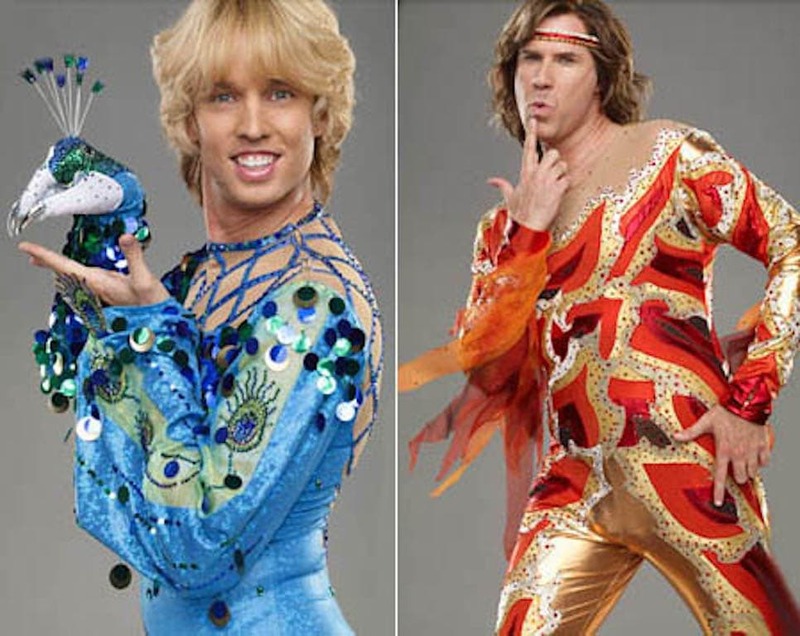 "The United States Olympic Committee is concerned. They want medals and preferably gold." 2020 will be here before we all know it, bringing with it the Olympic Games and surfing’s first ever appearance. Australia is turning its proud eyes toward Bede “The White Fijian” Durbidge to train up their Julian Wilsons and Noa Deanes for silver. Brazil has some fabulous head surf coach, for certain, but won’t need him or her as Gabriel Medina, Filipe Toledo and Italo Ferrari will be prohibitive favorites to split the gold. China has one of the greatest Australians to ever get elbowed in the face (Pete Townend) and South Africa has Michael February. Ummmmm yeah, maybe the USOC (United States Olympic Committee) should lower its sights to 5th – 7th place. Or give Filipe Toledo a green card. Cheyne Magnusson to bring his Waco wave-park sorcery to Wet 'N' Wild Palm Springs! Redemption: Team USA's new coach calls Steamer Lane "one of the most high-performance waves in the world!" Longevity: World's most famous surfer-songwriter declares, "I want to surf into my eighties!" Tokyo 2020: U.S. Surfing facing "a bleaker situation" hires new head coach!